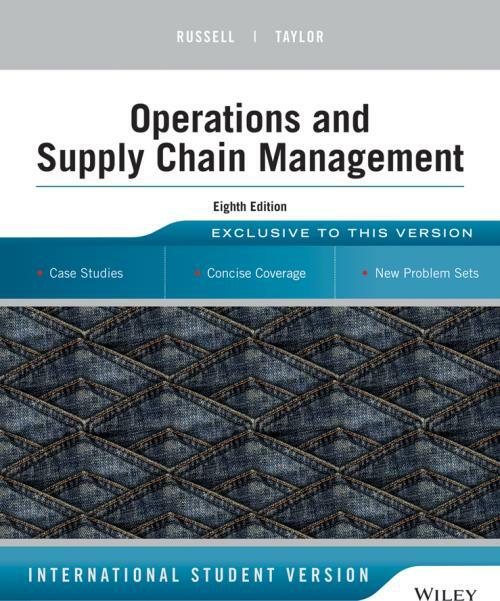 Russell and Taylor s Operations Management, 8th Edition is designed to teach students how to analyze processes, ensure quality, create value, and manage the flow of information and products, while creating value along the supply chain in a global environment. Russell and Taylor explain and clearly demonstrate the skills needed to be a successful operations manager. Most importantly, Operations Management 8e makes the quantitative topics easy for students to understand and the mathematical applications less intimidating. With WileyPLUS, students can practice and complete homework in an automated online environment that facilitates learning and understanding, while quickly accessing the eBook and student resources. In the 8th Edition, the production process and global supply chain of denim is used to introduce OM topics, and helps students see how all of the pieces of operations management fit together. Appropriate for students preparing for careers across functional areas of the business environment, Operations Management 8e provides foundational understanding of both qualitative and quantitative operations management processes.